Student presenters celebrate after being awarded at CSUNposium's Award Ceremony at the USU Grand Salon on April 5. Photo by David J. Hawkins. Participants of this year's CSUNposium gather at the USU Grand Salon on April 5 as the full-day event culminates. Photo by David J. Hawkins. The ARDENT team pose for a photo with advising professor Amiel Hartman (far right) outside Jacaranda Hall. Photo courtesy of Holland Mills. First responders often have to navigate dangerous topography and collapsed structures, putting their own safety on the line to look after others. CSUN seniors Nathan Boyd and Holland Mills, along with an entire team of fellow students, are hard at work building an insect-inspired robot that can take their place in the most treacherous situations. A multilegged walking robot, ARDENT (Arthropod Robot for Dynamic Environments and Terrains) is designed to assist search-and-rescue teams in precarious terrain — like many of the areas around Northridge in 1994. Its main purpose, Mills said, is to protect first responders and minimize the loss of human life in the process of saving others. “If the robot gets destroyed, that’ll be pretty bad. But at least we didn’t lose a human life,” Mills said. Boyd and Mills presented the project to hundreds of buzzing students and faculty flocked to the University Student Union (USU) on April 5, curious to see and hear their fellow Matadors share new insights from months of research, the evidence was overwhelming: Research can be an exciting part of campus life. 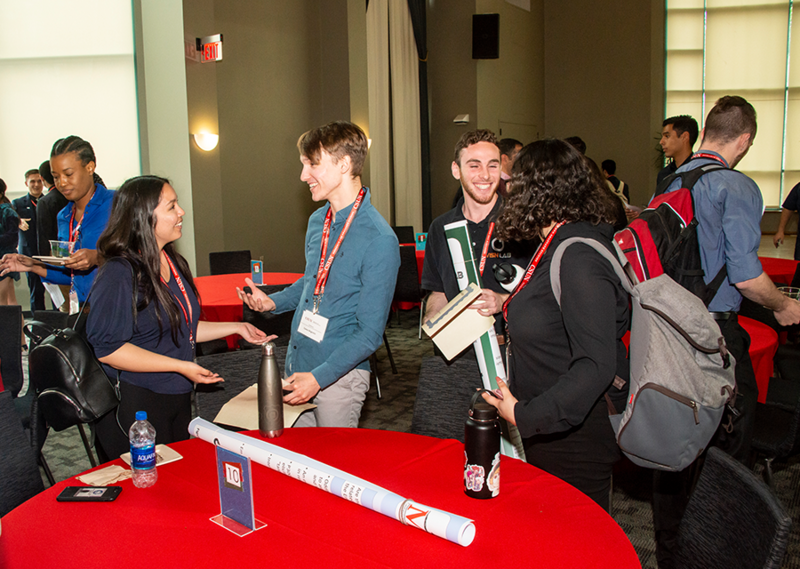 At the 23rd Annual Student Research and Creative Works Symposium, better known as the “CSUNposium,” students at graduate and undergraduate levels showcased their academic and creative work through oral and poster presentations. 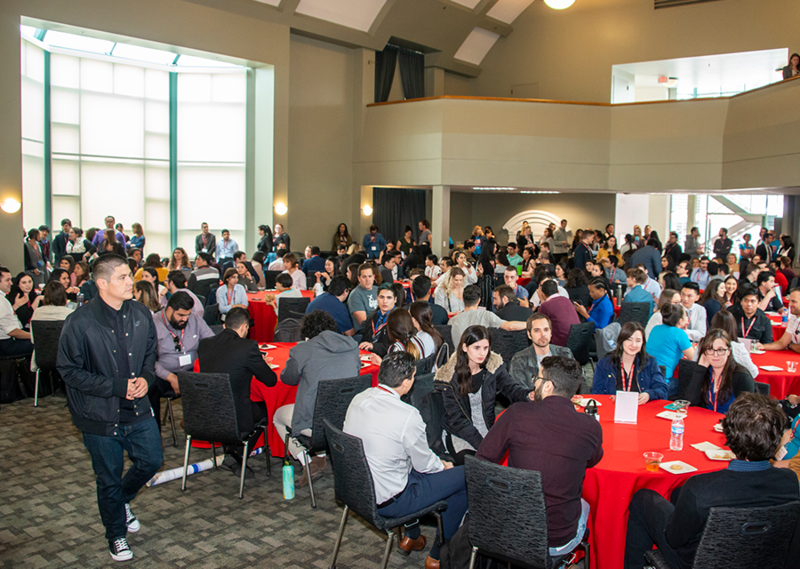 Organized by the Department of Research and Graduate Studies, the symposium is a means for CSUN students across all disciplines to share their work, and for the wider CSUN community to learn more about the academic discoveries their peers are making. The full-day event included four sessions of short oral presentations and 23 sessions of more in-depth, 10-minute oral presentations throughout the USU complex. In between the oral presentations, more than 200 student research teams showed off their work at morning and afternoon poster presentation sessions. The CSUNposium culminated in an awards ceremony in the afternoon. One winner, in the undergraduate level of the Social and Behavioral Sciences Category, was Alana Parks, a junior majoring in psychology, for her presentation on behalf of her team, which also included fellow psychology students Jonathan Benitez and Stephanie Dunn. The studies found that participants would often classify any “biracial” face into a monoracial group — belonging to one racial group — and attempt to fit them under the “Latino” or “Middle Eastern” categories, regardless of the two components that made up the biracial face morph shown to them. The project raised questions about why this might be the case, and whether resulting images from face-morph technology actually mirror the appearance of real biracial individuals. The group’s poster highlighted the latter by displaying a side-by-side comparison between generated morphs and real individuals of the same ethnic combination. Joining other student presenters during the morning poster session, Boyd and Mills, both majoring in mechanical engineering, shared with attendees more about ARDENT and the intensive research process involved in constructing a robot. The four-legged design of ARDENT was inspired by the anatomy of an insect and boasts impressive mobility around debris and other “unstructured” terrain. Furthermore, it has a wingspan of 52 inches but can compress to 12 inches, allowing it to squeeze into areas human rescuers cannot. ARDENT can be controlled remotely, allowing rescue teams to scout one area while it searches another in person. Its simultaneous localization and mapping (SLAM) technology then uses sensors to generate a 3-D map of the space — which can be later translated into a 2-D one — that can help inform rescue teams which areas are safe for them to enter, and which are not. The student team behind the project tested this technology on campus by generating a 3-D map of Jacaranda Hall, which they featured on their poster. Research on ARDENT began in summer 2018, and the construction of the robot began in the fall. 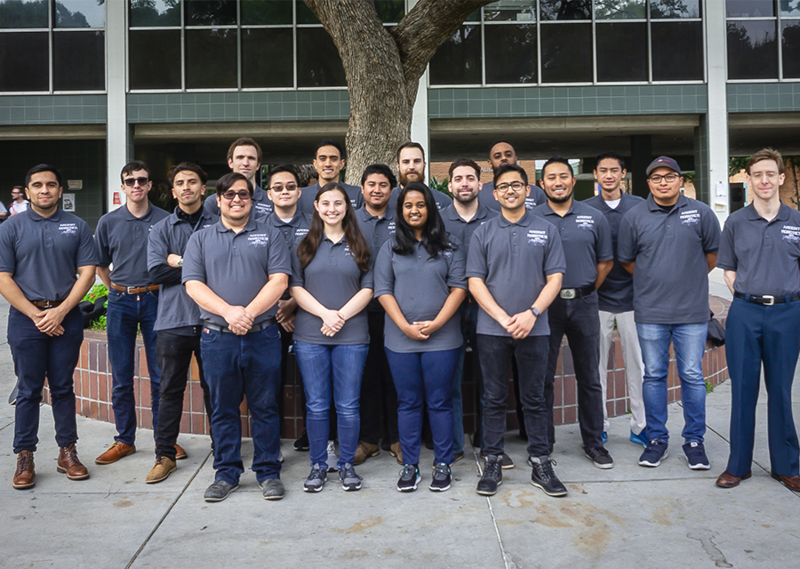 The team was composed of 18 CSUN students and five volunteers specializing in mechanical engineering, computer science, computer and electrical engineering, and manufacturing systems engineering and management, all working under the guidance of the students’ mentor, professor Amiel Hartman. Boyd said the ambitious project was an expensive endeavor, and the biggest obstacle in completing it was obtaining the funding. However, after talking to a number of companies willing to share funds for the project, and getting assistance from CSUN’s Department of Mechanical Engineering, they were able to raise the money needed to build the prototype and run tests. Furthermore, with a machine shop at the team’s disposal in Jacaranda Hall, the team didn’t have to leave campus to build and get all the parts they needed for the robot. “The challenge of a poster presentation is that its really difficult to condense everything that’s been researched and designed over the course of eight months and fit it into an easy-to-understand display,” Mills said. Despite the challenge, being able to tell other students, as well as faculty and staff, about their work was rewarding nonetheless, he said.